There is no better place to see nesting sea turtles in the U.S. than Florida's Atlantic Coast. Sea turtle nesting grounds are limited exclusively to the Southeast region of the U.S. They extend from the Florida Keys to Virginia on the Atlantic Coast, and from Texas through Florida. An amazing 80 percent of the sea turtle nests laid on the U.S. East Coast occur between New Smyrna and Boca Raton. Most nesting turtles made loggerheads but four other species also nest in the area.Go to Where To See Nesting Sea Turtles. Adult sea turtles are sizable; even the smallest weighs between 200 and 300 pounds. The opportunity to closely approach such a large endangered creature on its own grounds, without the slightest danger, is remarkable. Why join a guided turtle watch? Because it's one of Florida's most unforgettable experiences. Everyone, especially Floridians, should go on a turtle watch at least once. 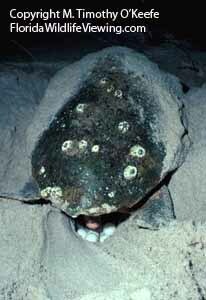 The majority of turtle watch programs are on Florida's Atlantic coast, which has the greatest concentration of nests. The beaches in the Melbourne area are the most heavily visited. Although turtle watches are held in June and July, most reservations are taken in May, some in April. Spaces fill quickly, so call as early as possible. The number of people allowed to participate on any one night is quite limited. Advance reservations are mandatory. So are long pants, long sleeve shirts and insect repellant! No flash photography.